Degelman landrollers, the most popular roller on the market, will increase yields for high quality pulse crops. These rollers are the ideal piece of equipment for harvesting short stature crops, lodged pulse crops and pulse cereal mixtures for silage. 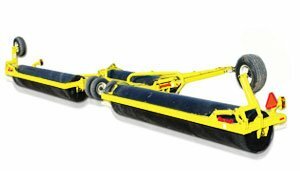 Degelman rollers provide a smooth and level surface for faster, easier harvest operations and better seed-to-soil contact. Cutter bars can get closer to the base of plants to reduce yield losses and reduce guard, sickle section breakage as well as expensive internal combine parts. Adjustment and operation of lifter fingers is easier. Degelman rollers will also reduce "earth tag" or soil on the seed, thereby improving quality yields. Grower experience suggests that an empty roller (without ballast) will be as effective in breaking up soils lumps, smoothing out row packer impression and pushing down stones as a land roller half full or full of water ballast. Degelman packing pressure of 350 lbs/ft² is the ideal packing force on seedling density and grain yield. The rigid frame is made out of six inch structural tubing. The drums are manufactured from 36 inch diameter pipe with over-sized shafts and bearings. Extra heavy duty cross joints and high quality cylinders and bearings are just a few of the standard features. Used as both pre-emergent and early stage post-emergent applications, Degelman rollers work especially well under drought conditions. Field peas and lentils may be rolled after emergence, although pre-emergence rolling is preferred. When faced with the choice to either spray early or roll early, growers should know that spraying first is recommended instead of rolling. Early weed removal, especially under higher weed pressures, will result in higher yields.